Bayocean was to be a wonderful place. When he returned home to Portland, Potter told his father and business partner, Thomas Benton Potter, about Tillamook Spit. The two bought the land, and set out to create what T. B. Potter described and promoted as "the Atlantic City of the West." The name of the new community came naturally to mind when the Potters looked at their land. The spit formed one wall of Tillamook Bay, so the ocean was on one side and the bay on the other. The spit was about a thousand feet long, and close to a half-mile across at its widest point. Bayocean Park, the Potters thought, eventually would cover much of this 600-acre site. At the heart of the development was a grand resort hotel. But the town also was to have other htels, homes for workers and happy residents, businesses to support it all, even a railway. What it didn't have at first was a road leading to it, and it had no natural source of potable water. The latter problem was solved by an ingenious use of coastal springs, including some at Cape Meares, five miles away. The budding town was far enough along to open for business in 1912. But the only access was by boat until a road was cut through from Tillamook in the mid-1920's. Bayocean looked to be every bit the paradise the Potters had planned. Many of its residents had sunk all the money they had into the new town. The Potters knew how to sell Bayocean. In the Jan. 1, 1912, edition of The Surf, Bayocean's "newspaper" (actually a promotional tool for the developers), the lead story exclaimed "the environments of Bayocean, natural and social, are unequaled; it logically becomes the natural selection for those seeking health, for those desirous of pleasure and society; as an investment, its advantages are apparent to the layman as well as the engineer and capitalist." That was, at least on the surface, true. And Bayocean grew and thrived. It did, indeed, become a favorite vacation spot of many. The town looked forward to a prosperous future. 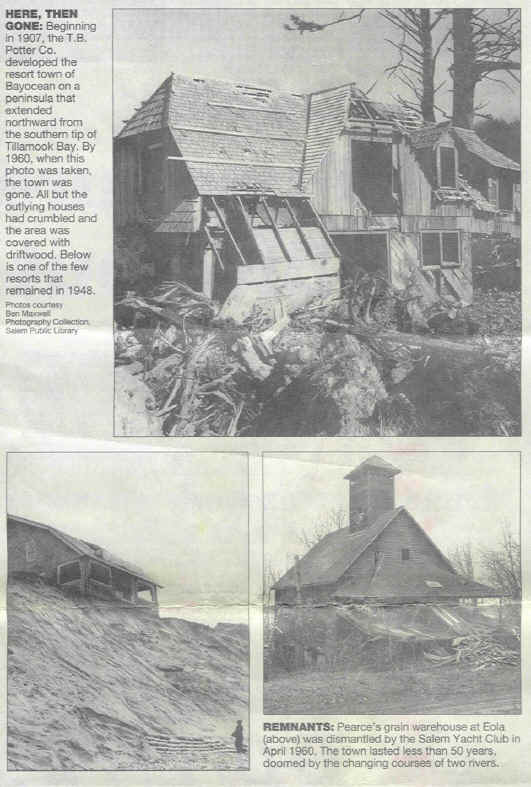 But everyone had ignored one major fact; Bayocean was built on a spit that reached into the sea, a spit that was formed by the erosion of the shoreline by the ocean, an erosion that wasn't going to stop merely because someone built a town on Tillamook Spit. By 1920 the spit, and the town, had begun to slip into the sea. It was a slow process, but one that couldn't be stopped. One by one, the buildings vanished into the ocean, and one by one the people left Bayocean. By the late 1930's the remaining buildings were largely empty. The sea made an inland of what little was left of the town in 1952, and it was essentially inaccessible by 1953. By then, Bayocean wasn't even a memory to most oeple. The reasons for the erosion and the course it took were complicated but the effect was inevitable. Most of waht was still standing of Bayocean was considered a hazard and was razed. A few outlying houses lasted into the 1960's before collapsinginto the sea or being torn down. Eventually, construction of a new jetty rejoined the site to the mainland and made it into a spit again. But there is no trace of Bayocean, save for a few possible scraps among the dunes and shore grass. The sea had swallowed the grand dream of the Potters, and the hopes of all who believed in those dreams. For a detailed account of the history of Bayocean, buy a copy of "Bayocean: The Oregon Town That Fell Into the sea," by Bert and Margie Webber (Webb Research Group, Medford:1989; trade paperback; 206 pages; 12.95). Now in its third printing, this book not only details the history of Bayocean, it deals with other eroded areas along the Northwest coast.